Most homeowners will prefer to have a home that is known for its cleanliness, and this applies to the interiors as well as the exteriors. This cleaning has to include the roof for many other reasons than just aesthetics. A property that has a clean and well-maintained roof will fetch a higher lease rent, as also a better price if the owner does decide to sell it. If you have a lot of trees and other plantation around your home, it is more than likely that the dead branches and leaves will find their way onto your roof. This is especially true during the autumn when a lot of trees shed their leaves. An accumulation of such vegetative matter on the roof can then find its way into the gutters and prevent them from functioning as they should. This debris can then block gutters and drain pipes and cause the gutters to overflow on to the side walls and into the foundation, which can then lead to settlement and other problems. 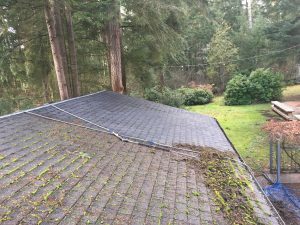 While cleaning the roof of leaves and debris can be undertaken by the Puyallup WA homeowner by himself, it is still a job that needs to be undertaken with a lot of care and regard to safety. 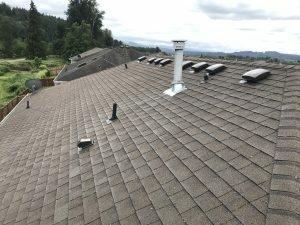 You can always call in a roof cleaning company based in Puyallup WA so that the work is carried out by professionals with the right equipment and with the right regard to safety. Before you appoint any such agency, make sure that they have experience and have been in the business for some time. Roof cleaning is easily carried out with the use of pressure washing machines, but may not be the right method if you have shingles on your roof. It is far better to use gentler methods. Use biodegradable detergents, if you do need them, as they are safe to use. Roof cleaning is best carried out at least once every two years, and care must be taken to see that all signs of dirt, mildew, and other stains are removed during the cleaning process. The cleaning of gutters must be undertaken at more frequent intervals and especially after storms or high winds have resulted in leaves and small branches to get on to roofs. If you are carrying out the process of cleaning your roof on your own, make sure that you take all the necessary safety precautions, have the right ladders and other devices that allow you to walk on the roof safely. Also, ensure that there is always somebody on the ground to assist you and keep children and pets away from the roof perimeter. 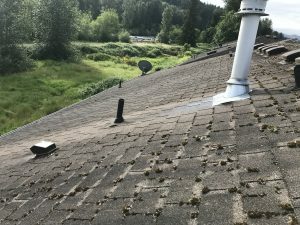 First remove all the dry dirt, debris, leaves and other things that have accumulated on the roof and in the gutters, and lower it all on to the ground. In Washington state we typically deal with 2 or more types of growth at least. Moss, mildew, lichen, fungus, and mold. Typically these grow heavily on the north side and rarely on the south side – this is because of the amount of sun each side receives. To remove growth the best way is to use a growth removal treatment product such as zinc. If there appears to be large moss balls, these need to be brushed off before application of treatment. Restore offers 3 basic techniques of roof cleaning not including pressure washing. We do not recommend pressure washing for most roofs because, while pressure washing is great at removing the moss and mildew, it will also cause roof erosion which equates a roof with a shorter lifespan. You can see why pressure washing may not be an ideal roof cleaning method for composition roof cleaning. The first method of roof cleaning we offer is debris removal. We will remove all tree debris from your roof and brush moss balls off the roof. This is absolutely essential so the moss does not have a source of soil to feed on. The second method of cleaning is moss treatment. 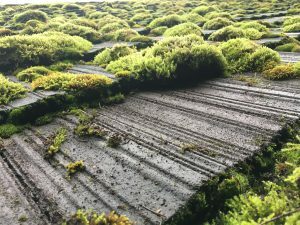 If the moss does not die it will not be eliminated from the roof. Even after pressure washing, it is extremely unlikely that all roots have been eliminated nor does pressure washing kill the moss spores. The treatment we use will last 2-5 years. The third method of roof cleaning we use is called Soft Washing. Soft washing is the process of using a strong detergent to kill all debris. The roof will look new after.